Set right on the edge of the pretty Lake Garda, Vacanze Glamping Boutique provides guests with a first rate luxury camping experience. With plenty of activities to take part in and areas to unwind in, the site caters to guests from all walks of life. A number of enchanting boat trips can be enjoyed across the large and lovely Lake Garda, and this is a great way to visit the traditional villages that can be found on the edge of the lake. Why choose Camping Vacanze Glamping Boutique? 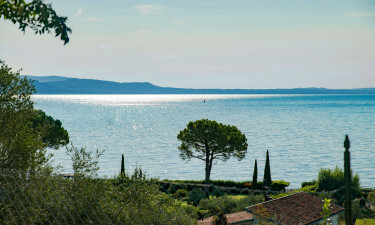 Lake Garda is edged with a strip of golden sand and guests will be able to stroll down here from their mobile home to soak up the sun. The waters of the lake are cool and clear and also ideal for those who want to take part in aquatic activities such as kayaking. Of course, water lovers do not need to venture far during their camping holiday as there is also at outdoor swimming pool at Vacanze Glamping Boutique. Parents can take their place on one of the sun loungers to work on their tans while their kids splash around in safety.